These are some of the showiest plants for containers, annual borders, and mixed borders. 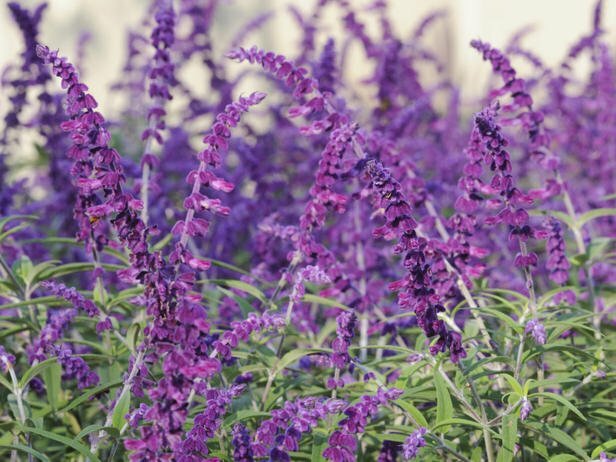 Butterflies and hummingbirds love Salvia almost as much as do color-hungry gardeners. A relative of the familiar kitchen sage, flowering salvias produce spikes of small, densely packed flowers atop aromatic foliage. These heat- and drought-tolerant beauties bloom from early to late summer in shades of blue, violet, red, pink, and white. Plants grow 18 inches to 5 feet tall, depending on the variety. They work good in beds and borders, make great cut flowers and are deer resistant. 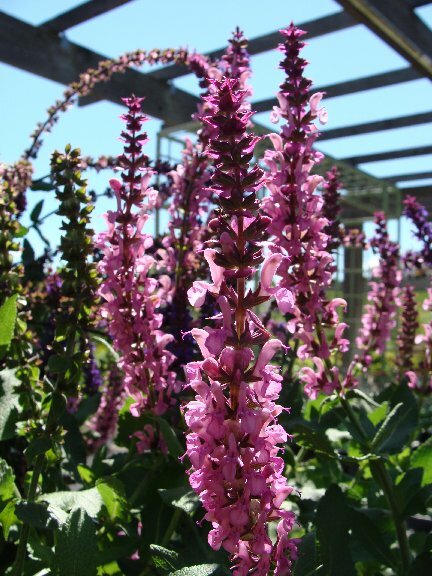 Check the tags when choosing salvias, because not all plants are hardy in all regions. Most salvia varieties don’t like cool weather, so plant them outdoors after all danger of frost has passed. Features: easy care/low maintenance, good for cut flowers, good for containers, is drought tolerant and attracts birds, hummingbirds and butterflies. A member of the mint family, the care of salvia plants is moderate with most growing salvia varieties. Select a planting site that received part sun to full sun and has moist but well-drained soil. Requirements with watering, as with growing, vary among the different salvias, but most prefer to dry out between waterings to ½ an inch deep. Fertilization with a time-release plant food encourages growth and more flowering spikes. Salvias flower on spiky racemes or panicles rising above the plant. When blooms are spent, remove these spikes to encourage additional flowering. If the salvia plant begins to look tired or overgrown by midsummer, you can also remove one third of the plant. Salvia plants will re-grow and reward you with blooms that last until autumn. Divide in early spring, and pamper newly divided clumps. Take cuttings spring through fall.